We went to Kageyo. This is the community that is far away and made up of Rwandan refugees who fled to Tanzania during the genocide. A few years ago Tanzania sent them back to Rwanda. They were forced to leave quickly, and when they arrived in Rwanda, they had nothing. This led the government to build Kageyo. The majority of the students in the school in Kageyo are sponsored and doing well despite their circumstances. Getting to see Kageyo after last year's drought was wonderful. Driving into the town you must drive through the valley through all the farming fields. People were working and harvesting because there were actually crops to harvest. Praise the Lord! I know this year has been such a gift for them. Kageyo is also really special because you leave and take half the dirt with you. Every place on your body is covered. The shower after the special Kageyo skin treatment is lovely, and an interesting red color runs down the drain. 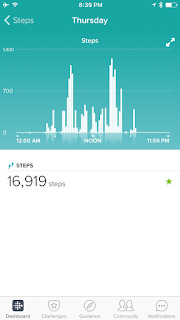 Also this... Amanda, who wasn't feeling well and didn't move much, "walked" almost 17,000 steps. False. 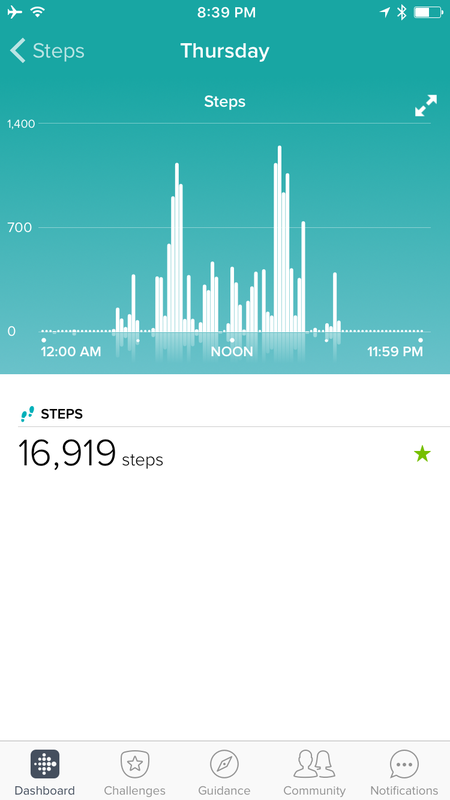 The two peaks on her FitBit graph was the bumpy ride to Kageyo. We had a pretty good laugh in the room. Overall, the time in the classrooms was fun, productive, and encouraging to the teachers. I saw many friends from earlier trips and made new friends. I taught an English lesson for 7th grade and continue to realize how much of a language barrier there is. It helps me to appreciate my classroom. Day 5: First Day of the Teach Conference! Early morning! On the bus at 5:45 to drive to Kayonza for the conference, which is an hour and a half away. We were all dragging and desiring to remain in bed. But, the Lord provides the strength that we need to serve His Rwandan teachers. Bob, Lucy, and Amanda presented this morning, and Bunmi, Janet and I presented after lunch. Presenting to people who do not speak your language is the most challenging part of the trip. Communication is difficult and worth it. We also had time built in to process the information in smaller groups. This worked really well and gave the teachers time to ask questions and plan lessons with us. My favorite part was sharing another taste of my TMC family with my Rwandan family. This year, I decided that Which one doesn't belong? needed to be shared. I chose the clock photo below and it blew. theirs. minds. that there didn't need to be a correct answer. wodb.ca please go check this out! Thanks Mary!! Here is a 360 photo of the teachers picking their four corners. LOVE. 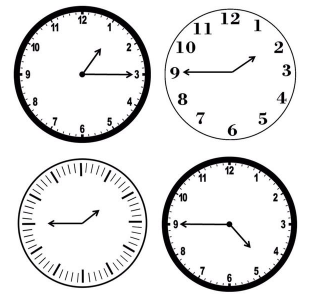 Then, my mind was blown when they gave me reasons for choosing the top left clock that included different types of angles and then they named them acute and obtuse. YES. BLESS IT. I love my math nerd family for changing my life and allowing me to share and change teachers lives in Rwanda as well. It is truly humbling and a blessing to share so many wonderful things that I have learned from brilliant minds. Cannot wait to spend time with them in July. I'm exhausted, so off to bed we go. Last day of the conference tomorrow, and with that the team's trip is half over. Thankfully, mine is only a third over, but still going so quickly. Love this country and its people and you. Thanks for reading!